Reviewed by Guest Writer J Kirchner. Okay, I am picky on this one… I have a MAJOR amount of shrapnel damage to my lower back, middle, back, oh heck, the whole back (82 MM’s have a way of doing that!!!). So I get picky about the comfort of the holster. I needed a holster for concealed carry of my Glock. My family is standardized on the Glock 19-C. Why the 19-C? 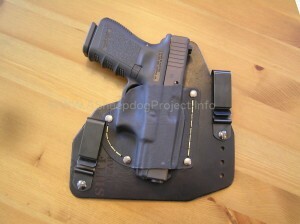 That is another review… back to the Ace-1 IWB Holster. The leather is firm and stiff, but the edges are smoothed and shaped for instant comfort and feel fine right out of the box. The leather broke in after only about 3-4 days of wearing it. (Nice! Just the right amount of give when you need it.) the Kevlar threads “look” like they won’t hold all that well, but, that is not true. A closer inspection will show they are double stitched, and that Kevlar is not going to break anytime soon! The rivets are solid at the 4 primary points on the kydex and I have no fear that the kydex is going anywhere soon. 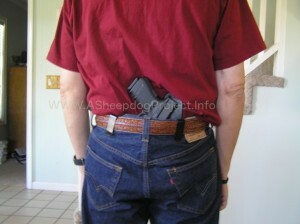 The adjustable clips are nice because I prefer to carry FBI style in the center of my back on a 45 degree cant. This was easily achieved by changing the clip on the right to the highest position and the clip on the left to the lowest setting. This Ace-1 IWB Holster is very comfortable. It took a day or so to break in, but, once it was broken it it just “rode” well. It never budges, the weapon stays secure, and it is almost undetectable when wearing. Actually about 8-9 out of 10 (10 being that I can not even tell I am wearing it). When carrying with a full high cap magazine it feels a touch “top heavy” and I am sure that the reason for this feeling is that it is a bit top heavy. You have a subtle feeling that the weapon is going to “flip” out of the waistband once in a while but, it never does. It never shifted or moved, but, it does have the “feeling” that it will, due to the top heavy weight of the loaded magazine. This MAY be an issue only when wearing it in the center of the back with the 45 degree cant. But, since I can not carry on the hip (it aggravates my shrapnel damage, and the shrapnel inside my hip) I really can’t comment. Maybe someone will be kind enough to try one and post their experiences for the rest of us?! The clips ARE strong. They remind me of the little clips in the old steel pot Army helmets. The ones in the helmet were a serious pain because they were soooo strong and stiff. They are great here!!! Once these babies were/are clipped to my belt they never once slid, moved, “Self-adjusted” etc. they clipped in place and STAYED there. All day, in and out of the car, to get groceries, at the range, etc. As mentioned earlier the kydex, rivet, and kevlar thread combination ensure a longevity measured in years and years. 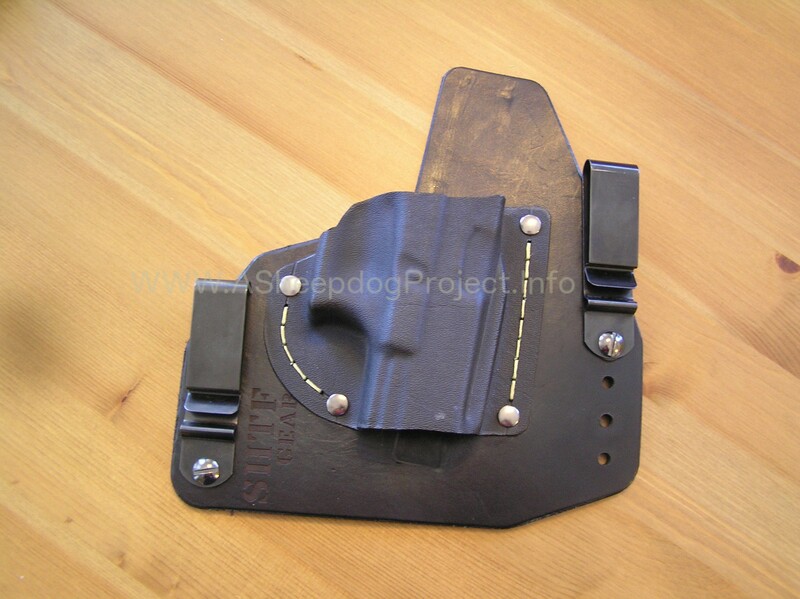 This is a holster that I do not see replacing anytime soon. Like my 12 year old pick-up, heck I just got my seat broken in… I figure in 15 years maybe I will look for another holster. I spent a day just wearing it and getting used to the feel and weight of the Glock in the holster. The next day I spent the day walking around in the house with an unloaded and cleared Glock. I would then draw over and over for about 5-10 min. and go back about my business. Once the basic muscle memory started to develop I would draw at random. I never had an issue getting a full grip and a clean draw. It was clean and consistently clean. Smooth on the draw and just the right amount of grip on the Kydex. Really a very functional system. It is a very concealable holster. I have a thin and wiry frame, I always have, just genetics. Anyway, trying to conceal a full frame handgun like the Glock 19-c, Colt .45 ACP, or my Browning High power is not something easily achieved. They all stick out like a sore thumb, and “telegraphing” that I am carrying in the grocery store or a gas station concerns me. I am not a threat to anyone but a bad guy, the last thing I need is to get shot by an over vigilant and nervous gas station attendant when I stop to get one of my kids a slushie drink in the summer. So this holster gets high marks on the rating. Basically a 9 out of 10. When carrying in the “FBI” position you can not tell at all. When on the hip, just barely if at all. A loose t-shirt over it in the summer and you are set. A jacket or fleece in the fall / winter and you can forget about anyone ever noticing. The leather is finished in a gloss black. Not bad, I like black, black rifles, black pistols, black holsters too. I would have preferred a subdued option, but, hey that’s what these reviews are all about. Also, if the subdued option is ever offered, an anodized or parkerized clip would be a must. It will rub back to a gloss shine, or a bare metal shine that would help to telegraphing you are carrying. 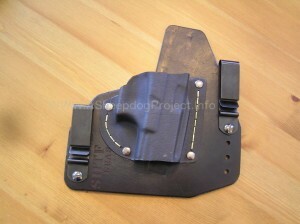 Over all no sharp edges anywhere, and, since this is an inside the waistband holster, that is IMPORTANT!!!! Smooth edges, and rounded on all edges and corners make this a will finished product. The Ace-1 IWB Holster is a great sturdy holster at a great price. It looks and feels indestructible, and it is made with quality care and components. I will be buying more of them and I do recommend them. The clips and the Kevlar / Kydex combo with the leather backing ensure years of use with little to no maintenance. Don’t forget the Locktite though.